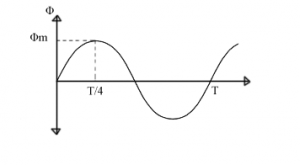 Figure 1.22 shows the representation of alternating flux, varying sinusoidally, which increases from its zero value to maximum value (Φm) in one-quarter of the cycle, that is in one-fourth of a second where fis the frequency of AC input in hertz. 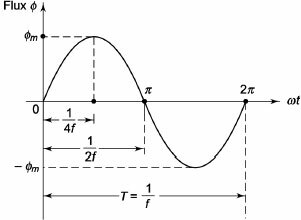 The average rate of change of flux is given by , that is 4fΦm Wb/s or V.
This rate of change of flux per turn is the induced emf in V.
Therefore, average emf/turn = 4fΦmm V.
Let N1 and N2 be the number of turns in primary and secondary. where is the maximum value of flux density having unit Tesla (T) and Ar is the area of cross-section. Equation (1.3) shows that emf induced per turn in primary and secondary windings are equal. Example 1.1 The voltage ratio of a single-phase, 50 Hz transformer is 5,000/500 V at no load. Calculate the number of turns in each winding if the maximum value of the flux in the core is 7.82 mWb. Let N1 and N2 be the number of turns of the primary and secondary windings, respectively.